Our first Makers' League kit of the year is an oldie but a goodie. 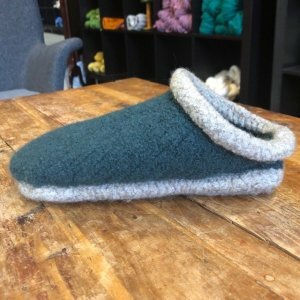 Felted Clogs, by Fiber Trends. This pattern has been on all of our lists for so long. We are finally making it happen! You can purchase the kit with the pattern or without. If you purchase the kit with the pattern, you'll get a hard copy and a Ravelry download. If you already own the pattern (like many of us do) you can purchase just the yarn. Make sure to click the color choice with NO PATTERN listed. 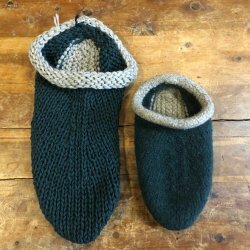 The slippers are knit on a US13 needle, you'll need a 24" and a 16" length. Then they are felted! What fun. The picture below is a before felting and after. 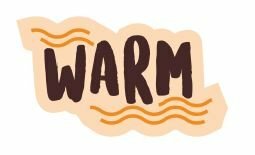 You'll get the super cute "warm" patch while supplies last, we only have 50 of each patch this year! If this is your first Makers' League project you'll get the Canvas Makers' League Tote Bag. If you have already joined the league, you'll get to add another patch to the tote bag you have already received. Every 5 patches collected in 2019 earns you 20% off a day of shopping at DKA! Remember, there is no "joining" fee or membership cost. You simply have to choose a Makers' League kit you love and buy it!